Press Release posted 5/7/14 – Joseph Manjikian celebrated his 104th birthday at the Pasadena Highlands with more than one hundred people in attendance, including family, friends, and community leaders. Congresswoman Judy Chu (CA-27) presented Mr. Manjikian with a Certificate of Congressional Recognition honoring his life. 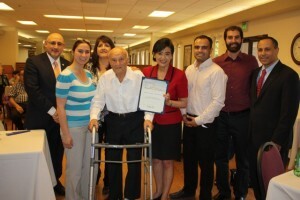 City of Sierra Madre Mayor John Harabedian, Armenian National Committee of America (ANCA) National Board Member Raffi Hamparian and ANCA-Western Region Board Member and Sierra Madre resident Raffi Kassabian, ANCA-Western Region Government Affairs Director Tereza Yerimyan, Armenian Bar Association President Garo Ghazarian and Kessab Education Association President Esther Tognozzi were also in attendance. in the media spotlight as it was attacked by extremist militant groups that entered Syria through the Turkish border and drove out the local villagers from their ancestral lands. Joseph Manjikian eventually immigrated to California in 1950 with his wife and two children, followed by a third child born in the US. His story symbolizes the American Dream. He worked as an auto mechanic for forty years supporting his family and establishing new roots in Los Angeles. 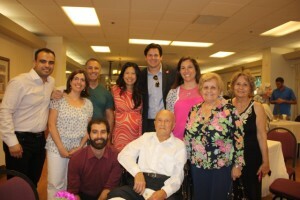 All his children represent first generation college graduates and raised their families with a strong Armenian-American upbringing. In his later years, he most enjoys being in the company of his eight grandchildren, seven great grandchildren, and all extended family and friends.